Last summer we had a heat wave, we had temperatures above +30C for several days. I think the highest was +32C. It was horrible. I rode to buy some ice cream and I was sweating, even though I was cycling with very low power. The wind chill effect was not enough to keep me cool. This week we got another heat wave. For us here in Very Northern Florida, In January that means it got above freezing. Below freezing is normal, above freezing in January does not happen every year. I even took my MD80 video camera out for a spin because it was so warm. It worked much better than in -15C. Yesterday I went to get groceries and other stuff I need for my lasagne. Again I was sweating. This time because I had too much clothes for the weather. So, even if this heatwave was 30 degrees colder than in the summer, the results were the same: sweating. The sunset was officially at 15:43 (3:43 PM), but this is a little later. Maybe 16:30. It was a cloudy day, just getting dark. What you see on the sky is not the sunset. It's light pollution. There is an outdoor skating arena maybe a kilometer away. The lights are huge and bright. We got some snow last night. I'd say the snow is about knee deep now. Today the snowmen are busy at work. This bikeway is partially plowed, but the snow plow has not yet returned. Or maybe he forgot. Who knows. On the left side, ski tracks! Somebody decided to use the MUP to get from A to B. In this case, the destination is probably an unpaved path that works as a walking/jogging/cycling route in the summer. When there is snow, the path is not plowed but ski tracks are made with a machine (whatever that is called in english). Mostly they are not good for utility cycling because they go nowhere. They're just tracks for excercise. On the right side, the plowed and gritted half of the bikeway. Nothing interesting there. Looks like the war on the motorists is getting hotter. In the news today is a story of some kids (12 and 14 year olds) dropping blocks of frozen snow and ice from a pedestrian bridge, aiming to hit the cars. As the perpetrators are under the age of 15, they are responsible for the damages but they'll not get jail time. They got at least two hits, denting one car's hood. 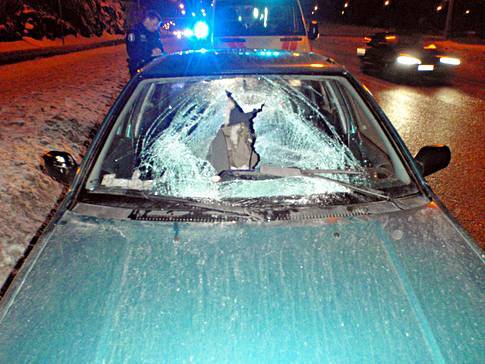 The other hit was more dangerous, smashing the windshield. Amazingly, the driver managed to control the car despite snow and ice crashing into the cockpit and nobody was seriously hurt. Look at the hole in the windshield, it must have been a big lump of ice! In the photo released by the police, there is some snow in the rear seat. The car was traveling on an expressway, with speed limits of 100km/h (or maybe even 120km/h, not sure). The falling ice would just make a dent on the hood or crack the windshield, it is not falling very fast, maybe 10-15m/s. But when the car is traveling fast, it's speed ( 100km/h is about 30m/s) is added to the speed of ice. So the total velocity is about 45 m/s, aimed low at the rear seat. And who is usually sitting at the rear seat? The kids. Unfortunately this is a game that some idiots want to play. Dottie from LGRAB (Let's go ride a bike) got her feathers ruffled when Copenhagenize posted about cycling in winter in Copenhagen. Copenhagenize bragged about their experienced cyclists who can get from a to b without studded tyres. Obviously, the conditions are not the same everywhere. Dottie has to cycle on the icy roads with cars. On those pictures there's not much ice to be seen, but it certainly looks slippery. And you can't see black ice. Earlier I posted about how important segregated bikeways are for winter cyclists here in Oulu. I even took some pictures to show the difference between the surfaces on the road and on the bikeway. I took a new shot to see how the ice has spread. The photo was taken at night so the colors are a little off. Like I wrote, the ice is covering more of the road surface. There is unpacked snow on the shoulders and nobody would like to ride on it. You'd have to cycle in the middle of the road. Studded tyres would be really useful. The bikeway looked pretty much the same as before. If we did not have segregated bikeways, almost nobody would cycle in the winter. Even now, three of every four cyclists will not cycle in the winter. Having to deal with cars and icy roads - forget it! We'd be lucky to get 1% modal share. Because the alcohol in the petrol is taxed more lightly, the new 95E10 is a little cheaper than the old 95E. About 60% of the price is taxes. But because alcohol is not as efficient fuel as petrol, the motorists will need to buy some more fuel to drive the same distances. The net effect is that driving will be a little more costly. I went out and rode around and checked the current prices on two stations nearby. Both had the same price, 1,499€/l. That is about $2 USD per liter, or $7,5 per gallon. So you can see why cycling can be an appealing alternative to ridiculously short car trips. Every time we here in Very Northern Florida read the chaos a snowstorm or a little -20C freeze creates we feel so smug. Why can't they handle a little snow without calling national emergency? It's just snow, deal with it! Our airports run just fine all winter. Well, of course if you get snow only once a year you do not have the fleet of snow removal vehicles we do. And if you usually have temperatures around freezing, you do not have the thick insulation and double- or triple glassed windows on your houses nor the clothes to wear when it gets cold. Just last week Bornholm got 1,5 meters of snow and that much snow would be a huge problem for us too. About half a meter of snow in a day would be a record breaker for most of the Finland, and more than 25 cm would be exceptional. It's because we are so far north and the air is cold and dry. There just is not much moisture in the air, unlike eg. the Bornholm which is an island surrounded by unfrozen sea. Oh, the sea freezes here in Very Northern Florida and some people go skiing, skating or ice kiting (a kite pulls the person on skis/skates) or ice sailing there. Last winter Helsinki, the capital of Finland had problems with a long and snowy winter. It did not snow half a meter a day, but slowly it piled up. There were even calls for recruiting the unemployed to shovel the snow. They have places were they put the snow, but when the snow just kept coming those snow dumps filled up and after that they had nowhere to put it. So the streets were getting narrower and narrower when the snow was plowed to the sides. The other day I was coming home and saw this pickup truck with a snow plow attached and I managed to shoot it. The city maintenance crews use them to clean bikeways, and they can be used to clean some other areas too. It has it's uses and they can get more plows on the road with these. Good for a quick clean-up. This machine was parked on a street waiting for more snow. As you can see, this is a more serious snow removal tool. It can push hard packed snow away unlike the light truck plow. Machines like this and tractors with a front loader are used to load the snow to trucks or tractor trailers to move the snow to a snow dump if there is not enough space to just plow the snow to the side or if there would be problems with the water when the snow melts in the spring. Heavy trucks are used to plow the roads and highways and they can grit or salt the road at the same time too. 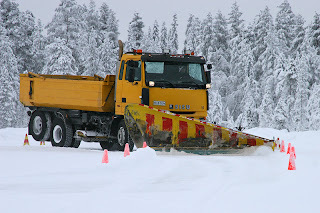 This photo shows some driver testing his skills with the snow plow. Of course, the farmers can't plow the fields in the winter so they plow the snow. Many farmers work as contractors to clean the smaller roads. 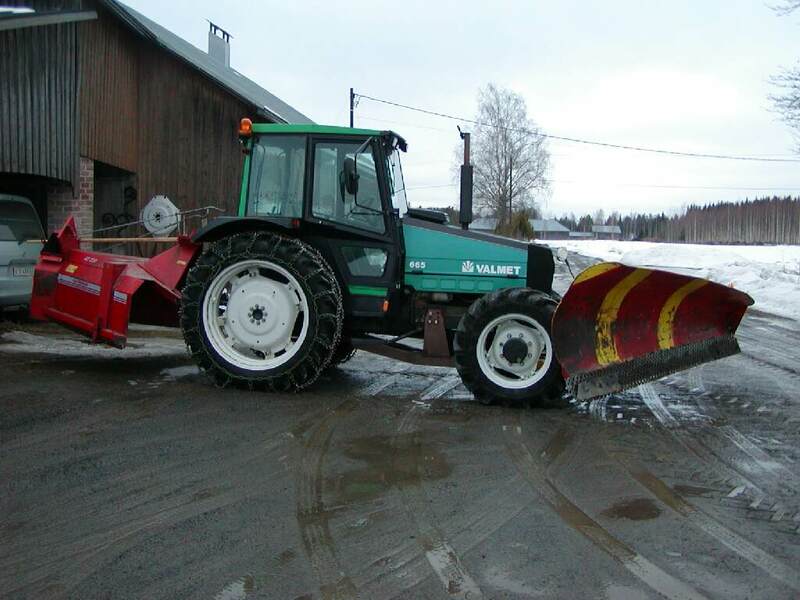 The tracktor can be equipped with various tools needed to remove the snow and for gritting. Small roads are not salted. I was originally going to post how I had a near-miss situation with a car. Of course I'd have to hugely exaggerate it to make it sound dangerous. But when I was writing about that I found a better story. After the holidays I needed to get some groceries. The shop I went is about 2 km away. I realized I almost always take a different route going there and coming back. Off my head, I can't think of any other case I do the same. The reason for different routes is the small hill on the route to the shop. Even though Oulu is considered flat because it's on the coastal plains, there are some hills that you need gears for. They are just too steep for single speeds. There are two basic short routes to the shop. (The slightly longer ones are ignored for this post. I'll have to test them to see if they are better.) A gently sloping route or a steep route. The steep route is basically flat except one 150m long, 10 degree slope. The climb is about 15 or 20 meters. At the bottom of the hill there is underpass (railway) so the climb is higher than the natural lay of the land suggests. The Steep route bikeway seen from the side. The route goes through an older section of the town with old single family houses and the roads are really narrow and visibility is limited. So I do not like to go down this steep hill because I'd have to brake all the way down to keep the speed in control. There are cars and people moving around so I can't just race downhill. And I'd break the 30km/h speed limit in the area, even without pedaling. A look from almost the top of the hill. Instead I take the gently sloping route. At one certain intersection rather than following the bikeway to the right, I ride straight through the intersection and ride on the narrow road. The road has no bike lane, so I have to ride on the road. I can coast downhill for several hundred meters and I don't have waste the potential energy by braking. I can use it to keep me moving. Very energy efficient. Perfect for us lazy cyclists. Going back home, I usually take the steep uphill route. I think it's partly because this way I get a shorter uphill section. But bigger reason is the intersection I mentioned above. If I had to stop there I'd have to accelerate while going uphill. On the steep hill I can avoid that. I wonder if the bikeway designers think of things like that?